Home Pregnancy Tests Home Pregnancy Tests How Does A Pregnancy Test Work? Why does the control line always show in the home pregnancy test? 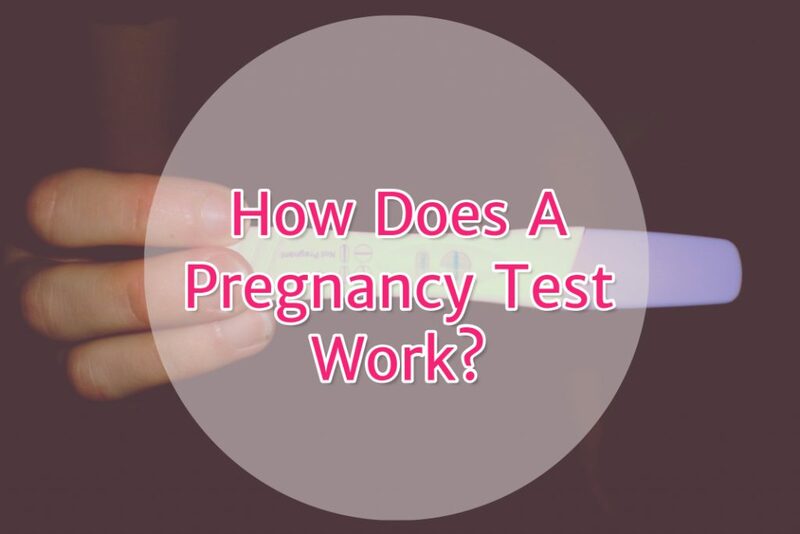 How does a pregnancy test work? A pregnancy test has special chemicals that are able to detect hCG in your urine. The pregnancy hormone coming from placenta starts coming along your pee. When you dip the test or pee on the stick the detector chemical on the kit attaches to hCG. Together, hCG and detector chemicals make a color that you see as a line. Digital pregnancy tests interpret the color and give a flashing response. For the stepwise reaction of pregnancy test read below. Isn’t it wonderful that a small plastic kit can tell you whether you are pregnant? But have you ever wondered how does a pregnancy test work? Earlier people used to say that a female is pregnant when she vomited after becoming sexually active. While some of the ladies were experienced enough to analyze, others were shooting arrows in the dark, and it could be merely vomiting!!! And you can’t merely rely on guesswork for such a crucial thing like pregnancy. It could be very dangerous not to be able to detect pregnancy just because you did not vomit! Considering this and the cases where the lady cannot go to a doctor for a pregnancy test such as cases of rapes, home pregnancy test has been revolutionary. Once a woman conceives, her body produces hCG (Human chorionic gonadotropin) which then shows up in her urine. This is after implantation occurs and the placenta formation. The placenta takes up the function of the brain for realizing hormones needed for the fetus. The placenta becomes an endocrine (ductless) gland during pregnancy. The hormone Human Chorionic Gonadotropin (hCG) is one of the hormones released by the placenta. hCG has a unique phenomenon associated with it that it starts coming with urine in a pregnant female. A pregnancy test whether a standard one or a digital one has an hCG strip. This strip has antibodies for hCG. In our body, if any foreign particle (antigen) enters, our body produces fighter particles to wage war against the invader. Scientists do a complicated experiment to make monoclonal hCG antibodies. hCG as a foreign particle is injected into an organism who can produce antibodies against it. These antibodies are replicated, and then a vast number of them is produced. These are like small keys which can fit in the hCG particles. Once they attach to hCG particles in urine, they give a color to indicate hCG presence. The control line doesn’t have hCG antibodies. It merely detects the urine components and shows the color. It shows that the pregnancy test is working correctly and is reliable. A control line also indicates that the pregnancy test has not expired. Expose the hCG strip to urine sample: You can expose the hCG strip of pregnancy test by either dipping in the urine sample or by bringing the hCG strip in the urine sample. On doing this, the hCG particles in the urine fall on the pregnancy test hCG strip. Since the strip is porous, it allows the urine to rise in it till the result window gradually. The hCG particles also move along with the urine. Urine rises in the strip: Place the kit on a counter or keep holding it directing the tip towards the ground. In the first case, the capillary action takes the hCG particles along. In the second case, the gravitation pull makes the urine run along the pregnancy test. If you hold the kit upside, then urine won’t rise in the home pregnancy test. The pregnancy test control line appears after this: When the urine comes in contact with the pregnancy test control line, it reacts with the moisture and gives a color. The control line merely appears because the urine has reached the level and it confirms that the kit is in working order. If the pregnancy test line shows: The pregnancy test line has hCG antibodies. When the urine reaches that level, the hCG particles in the urine attach to hCG antibodies resulting in color. If a woman is not pregnant or has just conceived and so the body doesn’t have a detectable hCG level, then the test line will not show or will take the time to show up respectively. If the reading time is up and Evaporation Lines or Big Fat Positive (BFP) lines appear: Home pregnancy tests always recommend to read the results within a specified time slot. Failure to do so can result in either Evaporation lines or Big Fat Positive Lines. Evaporation line appears when the urine evaporates entirely, and a line forms as a mark of the highest level reached by the urine left behind. Human urine has some components that give it a natural color. This further makes the evaporation line prominent. Some pregnancy test hCG strips are of an excellent quality that don’t allow any component of urine to remain in them. Big Fat Positive Pregnancy test is an informal term used for a thick line of a positive pregnancy test result. The big fat positive pregnancy test might further spread to cover the entire result window. And then you’ll be confused whether you made any mistake that you don’t see lines and instead see a colored window! Big Fat Positive is a borderline case. Once hCG level reaches 25 mIU/mL, it goes on doubling and this is the threshold hCG level for declaring a woman pregnant. On one side it is a very assuring display of a positive pregnancy test and on the other hand, if the result reading time has passed, then it can be mind-boggling. In short, home pregnancy tests detect if your urine or blood contains a hormone called Human Chorionic Gonadotropin (hCG). The body produces this hormone right after a fertilized egg attaches to the wall of a woman’s uterus. This is the principle behind the working of a home pregnancy test. The blood home pregnancy test uses a blood sample for the same purpose. In this case, the source of hCG changes but the working of the blood home pregnancy test and urine home pregnancy test is the same.